GIGABYTE showered four socket AM4 motherboards at CES 2017. These motherboards are designed for the upcoming AMD Ryzen processors and 7th gen. A-series APUs. The first motherboard is GIGABYTE Aorus AX370 Gaming 5 featuring RGB LED lighting, 10-phase CPU VRM design, four reinforced DDR4 DIMM slots, and two PCI-Express 3.0 x16 slots (x8/x8 when both are populated). The third x16 slot is electrical x4. Connectivity wise it has a 32 Gb/s M.2 slot, a 32 Gb/s U.2 port, two 16 Gb/s SATA-Express ports, and eight SATA 6 Gb/s ports. Four USB 3.1 ports (including type-C ports), eight USB 3.0 ports, Killer E2500 Gigabit Ethernet, and AMPUp! Audio. 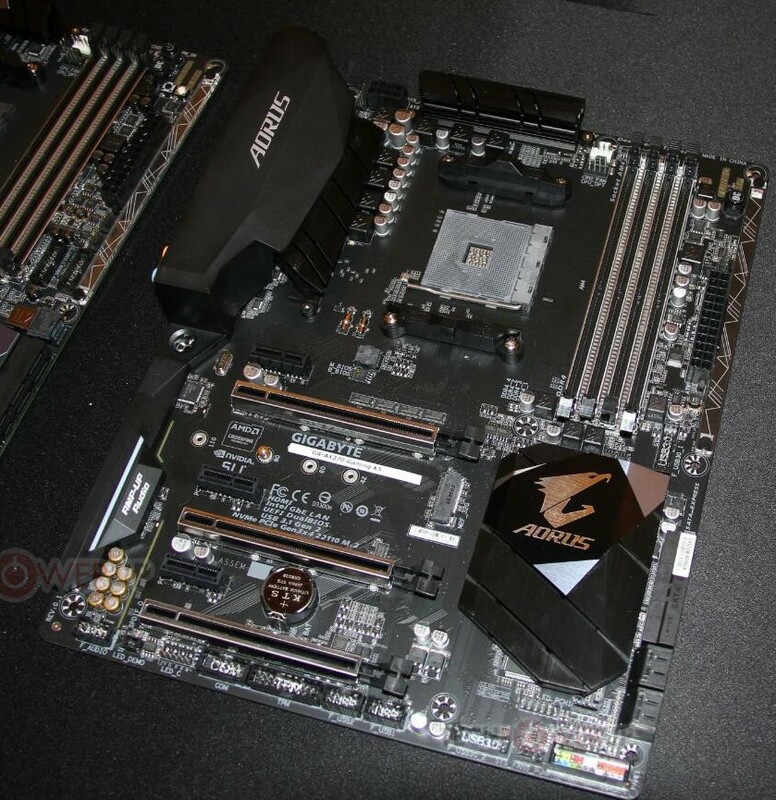 The second one is Aorus AX370 Gaming K5, which also an X370 chipset motherboard featuring a 7-phase CPU VRM design, four reinforced DDR4 DIMM slots, and two PCI-Express 3.0 x16 slots (x8/x8 when both are populated). The third x16 slot is electrical x4. Three x1 slots make for the rest of the expansion area. Storage connectivity includes a 32 Gb/s M.2 slot, two 16 Gb/s SATA-Express ports, and eight SATA 6 Gb/s. Four USB 3.1 ports, six USB 3.0 ports, 8-channel AMPUp! onboard audio, and Intel Gigabit Ethernet. The make for the rest of this board. The chipset heatsink features an RGB LED lighting element. The Aorus AX370 Gaming K5 also comes with RGB lights. 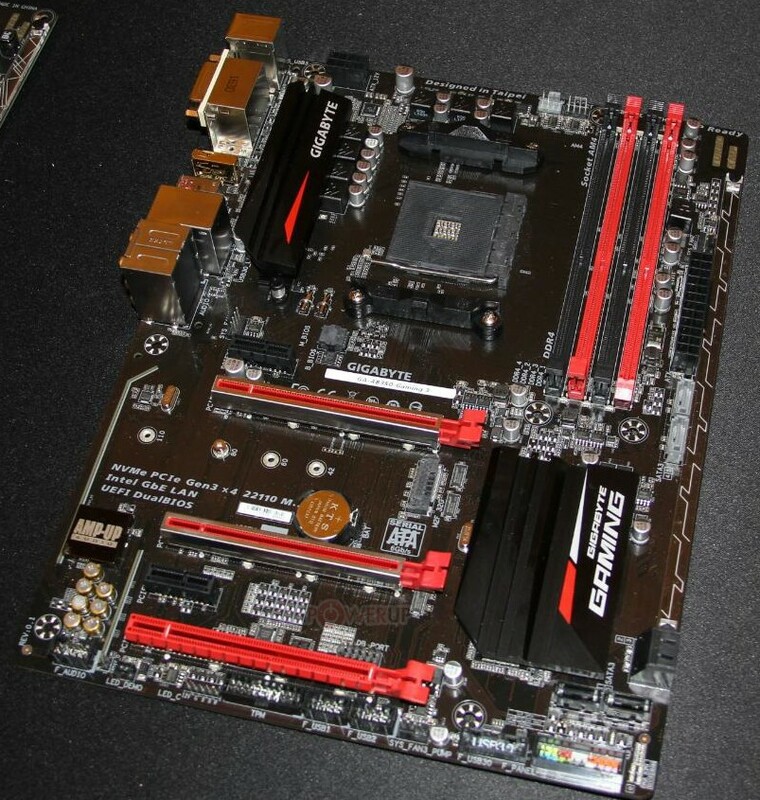 The third one is a midrange AB350-Gaming 3 a gaming-grade board comes with a Red and Black color scheme. 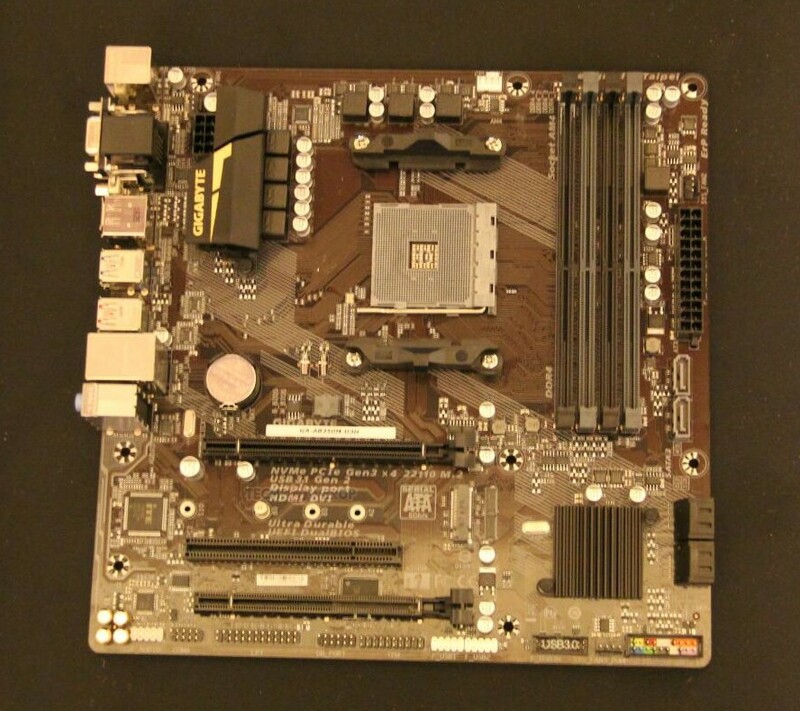 The board feature B350 chipset and features a 7-phase VRM, four DDR4 DIMM slots, and one PCI-Express 3.0 x16 slot. Other expansion slots include two x16 slots that are electrical x4, and two x1 slots. Storage connectivity includes one 32 Gb/s M.2 and six SATA 6 Gb/s ports (of which two are low-latency ports). Display outputs include DVI, DisplayPort, and HDMI. USB connectivity consists of two USB 3.1 (10 Gb/s) ports, and six USB 3.0 ports. GIGABYTE deployed its gaming-grade AMPUp! onboard audio solution with an 115 dBA SNR CODEC. The last one is The AB350-D3H an entry-level micro-ATX board based on the mid-tier B350 chipset covers the basics, with a 7-phase VRM, one PCI-Express 3.0 x16 slot wired to the AM4 socket, a second x16 slot that’s electrical x4 and wired to the B350 chipset, one legacy PCI slot; one 32 Gb/s M.2 slot and six SATA 6 Gb/s ports (from which two are directly wired to the AM4 socket); and connectivity that includes 6-channel HD audio, gigabit Ethernet, two USB 3.1 (10 Gb/s) ports, DVI, HDMI 2.0, and DisplayPort.